As you’ve probably gathered, we do a lot of home cooking but one thing we haven’t quite managed to wean ourselves away from is shop bought energy bars. It seems easier – if ridiculously expensive – to buy packs of granola bars, flapjacks and the like. It’s time we had a talk with ourselves. This has to stop! More often than not, these ‘healthy’ snacks are hideously unhealthy. Lots of them are packed with several different kinds of sugar or are chock full of artificial sweeteners, and many contain all manner of unpleasant additives. What’s more they’re just not as good as the ones you make yourself. Getting your oats out and the oven on is a no brainer then. 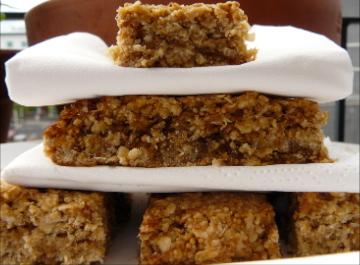 These chewy, fruity bars are terrific – really easy to make and adaptable to whatever dried fruit you fancy/happen to have lurking at the back of the cupboard. I made these with dried figs because a) I love them and b) when Bibi was very little she thought figs were called pigs and one her favourite treats was a ‘pig roll’. So, in homage to Bibi’s strangeness as a child, here’s the Veggie Runners variation on pig rolls. They’ll work just as well with dried apricots (avoid ones with sulphur dioxide though), dates, sultanas or cranberries – any combination of dried fruits, really. The dried fruit gives some natural sugars so you don’t need to add much to the oat mix. Oats, as you know, are a wonder food, helping to lower cholesterol and reducing the risk of cardiovascular disease. You can add nuts if you want to give the bars a protein boost (the recipe will handle about 50g chopped nuts without adjusting any of the other ingredients). They freeze well so scale up the ingredients if you want to save some for another day. They’re great for picnics, in lunch boxes and for nibbling on while you’re having a nice cup of tea, daydreaming about what to do with all the money you’re saving not buying overpriced energy bars. 2 Place the dried fruit in a pan and just cover with water. Bring to the boil then reduce the heat and simmer for 5 minutes (this is to soften the fruit slightly, not cook it). 3 In a large bowl, mix the oats, sugar, margarine and salt until the mixture resembles coarse breadcrumbs. 4 Drain the dried fruit but keep the liquid. 5 Place the dried fruit, coconut, lemon juice and vanilla essence in a food processor (or use a stick blender). Add a couple of tablespoons of the liquid from the dried fruit then blitz until the mixture is thick and pulpy. 6 Add the fruit pulp to the oat mix and stir well – it’s easiest to get your hands in and mush it all together. 7 Place a sheet of baking parchment or greaseproof paper on a flat baking sheet. Pile the mixture in the middle then shape it into a large rectangle about 1cm deep. 8 Score the shape of the bars into the top of the mixture to make them easier to cut when they come out of the oven. 10 Leave to cool then cut into slices. I’ve just started thinking about the same thing, mainly because I’m doing longer runs and rides now and want something more substantial than a gel to eat. My first couple of attempts haven’t been great so will give these a go. Also curious to try the rice cake type things from a cycling cookbook I found.